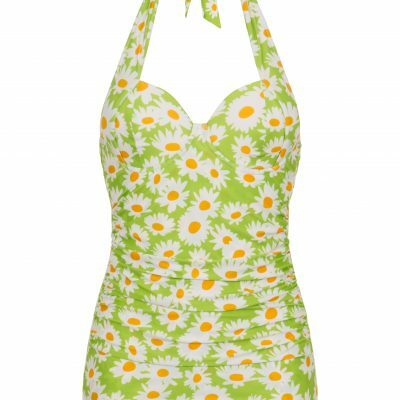 Introducing the Collectif Toucan Frilled Balcony Swimsuit is a cute vintage-inspired one piece from the collaboration with Playful Promises. She’s a fun and frilly piece, with frills top her 3-part padded underwired cups, and along the edge of her leg line. She extends from under the bust to a wide waistband where she joins to high waisted pants. She has full coverage at the rear for a classic look that’s sure to keep you comfortable on the beach or at the pool. 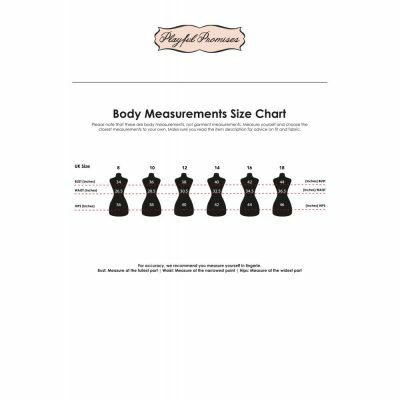 Her elasticated shoulder straps are adjustable so they will easily stay in place, and they can also be removed for a strapless option, or re-positioned for a cross over look. She’s available in our Toucan swim fabric, a bespoke print with blue tropical leaves, cheeky toucans, classic pink flamingos, and juicy yellow pineapples on a pale pink stretchy, smooth fabric. Her ruffles and straps are in a matching plain pink. Pair yours with a tropical hair flower and fun cat eye sunglasses for a beach babe look. 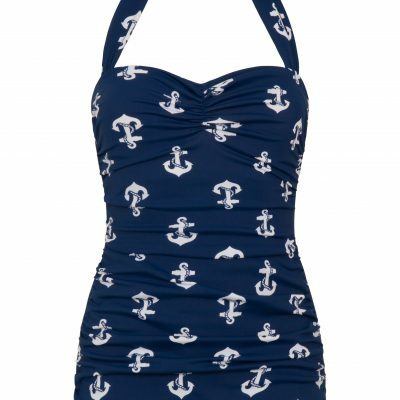 This range is developed in collaboration with swimwear specialists, Playful Promises. 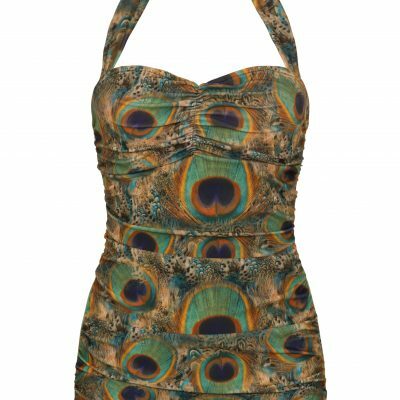 Together they have created a collection of vintage-inspired swimwear perfect for beach or pool parties, ranging from bespoke novelty print swimsuits and mix-and-match bikinis, to chic one-pieces and classic leopard print beach babe looks.